This guided tour takes place all year round. We are comparing Eiffel Tower Summit Access Ticket Prices from leading ticket suppliers and Try to find you Cheap tickets prices on the market. The "Skip the Line: Eiffel Tower Tour and Summit Access” allows you to acquaint yourself with the majesty and charm of one of the most visited attractions in the world. With this ticket, you use your available time most efficiently because you avoid waiting in long queues at the base of the "Iron Lady." You’ll also take a guided tour of the most-admired landmark in Paris and find out why it was first shunned by critics. At the end of this guided tour, you’ll be free to remain in the tower and explore independently. Unlike most other tours taking you to the Eiffel Tower, this one takes you to all 3 levels of the monument. It is particularly convenient if you are limited with time since it offers the priority entrance. Your Experience With Eiffel Tower Summit Access Ticket? With this useful ticket, you gain access to all 3 levels of one of the most iconic monuments in the world. As you advance toward the summit of the tower, you will enjoy fascinating exhibitions related to the Eiffel Tower and its interesting history. Learn about one of the tallest man-made structures in the world. 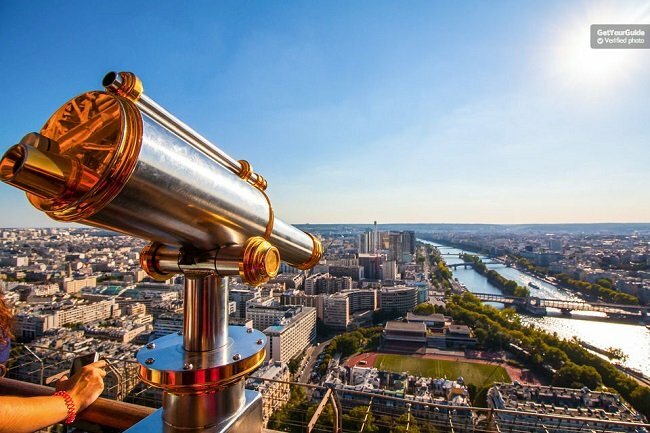 Enjoy panoramic views of Paris's cityscape and pick out other must-see attractions from your vantage point. Hear interesting stories and anecdotes from your tour guide. Appreciate views of surrounding Ile de France. On clear days you’ll see as far as the such as the world-famous Notre Dame de Chartres Cathedral. While on the 1st floor, you will have can feel like you’re hovering above a glass floor. What Eiffel Tower Summit Access Ticket Includes? Professional guidance by an enthusiastic and knowledgeable tour guide. Priority access to the 2nd floor of the Eiffel Tower. Complimentary access to the top level of the Tour Eiffel (if selected). 2-hour guided tour of the tower. The tour guarantees a more personal experience because it involves a small number of participants. Note that the top of the Eiffel Tower tends to swing a bit due to strong winds up there. There is the bar at the top level of the tower. Travelers Reviews about Eiffel Tower Summit Access Ticket? This activity is highly rated on the most popular travellers’ websites. It has 4.6 out of 5 on Get Your Guide, and 4.5 on Viator and TripAdvisor. Reviews of this activity state that there is a lot to do at the Tour Eiffel and that the guide was knowledgeable. They were able to see every individual landmarks of Paris and enjoyed the accompanying narrative of the tour guide. Access for disabled people isn't available. All purchases are final; cancellations incur a 100% penalty. Departure times you specify are fixed and it will not be possible to change them at a later date. Furthermore, the ticket can't be modified nor rescheduled. Both printed and electronic vouchers are accepted. Note that the 3rd floor is occasionally closed for safety reasons or maintenance. Closures to the 3floor do not affect the guided tour, but you will be unable to visit the top floor afterwards. Also note that the price of the ticket does not include entry to the summit. Make sure to arrive to the designated meeting point 15 minutes before the start of the tour. If you are late, you will not be refunded. Meeting Point: outside theEiffel Tower at the designated point - 19 Avenue de la Bourbonnais. Duration: Flexible, 1 hour to 3 hours is sufficient for a meaningful visit. Duration: Flexible, from the opening hours until the closure.